It’s back—a HUGE scrapbook for celebrating big memories! More than two feet tall and wrapped in bookcloth, this scrapbook really makes an impact. It’s perfect for designing large-scale spreads that showcase your mementos. 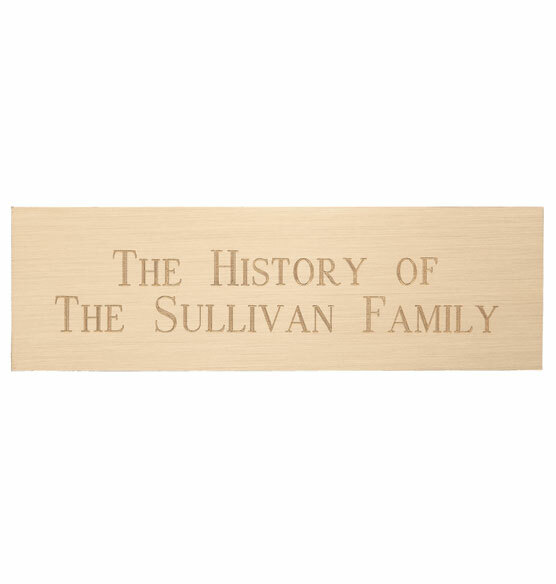 Add your name or a message to the included brass plaque for a personalized touch. I have a ton of pics (various sizes up to 9 x 11) and magazine pages that need to get into a scrapbook or album. Looking at the picture of the album described online and even having pictures on the page as an example, I thought this would be a perfect size scrapbook. If you are an artist with a portfolio, have a ton of kid art, or want to save entire newspaper pages--this book will do the trick. The quality was fine. There was nothing wrong with the product. I was shocked at how big this album was. My pictures and pages were lost on the page. Even the largest picture and magazine page was lost on the page. The album is heavy and bulky. Storage is an issue. No shelf I have could hold it. I had to send it back and it cost nearly $40 to send it UPS at the UPS counter. So beware, if you get it and want to return it, because the box is so big, you will get charged extra. But my fault on this, I didn't measure it out before ordering. My son had a great baseball season and was written up in the paper may times with a few full page spreads. This scrape book was perfect for mounting the full newspaper pages. I had to redo both my sons photo albums, and with this scrapbook I was able to include all baby information, along with photos through all the years of school and sports. All their stuff is together for each of them. I also have started my family history using these books so that I can include all bits and pieces of information I have along with the photos. The size of the pages let you get creative and able to add things that might come to you at a later time to add. I am making a scrapbook for the OEC's 50th anniversary to share at our Gala on Nov. 17th! This is a gorgeous album and the recipient loved it!!! Graduation from 8th grade. Should fit all high school memories and pictures. I hope so. As large as it is, I still over-filled one so need another. It would be great if Exposures also sold interleaving for this book. It seemed to be the right size to document my latest adventure! I needed a book to fit newspaper clippings. Loved the quality, price and aesthetics of this item. Could also get it within 2 business day. Very friendly customer service. I love the idea of putting some of the larger print photos that I don't have room to frame/hang. going to need it as a "book 2". Looks like the right size for a whole newspaper sheet. This was only one of two scrapbooks I found that can fit an entire newspaper page, which I thought was unique. Was looking for something specifically for newspaper articles. This "Gigantic Scrapbook" which I have just ordered is the perfect way to reflect the history of a special event for people to see in the future. I have used this scrapbook before and presented it to a National Organization and they now display it at their headquarters. It is in great condition, easy to use and priced right, too. I recommend it. To place all of the school art done by my son over his 12 years of schooling. creating a family history, I wanted something large enough for family documents that could be accented with pics, like my grandparents immigration naturalization papers. Great way to store children's artwork. Exposures offers quality merchandise! I've been waiting for a scrapbook with removable pages for my genealogy and family history. I never liked the three ring binders. Am looking forward to seeing how it works for me. Thank you for delving into items that work for us. Exposures makes the very best albums and pages for archiving family memories. how many photo pages come with album? 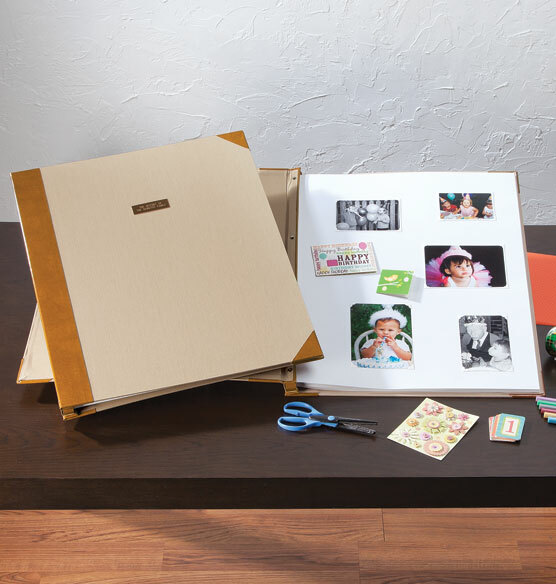 Are photo protector pages and keepsake pages available for the Gigantic Scrapbook? BEST ANSWER: Thank you for your question. We do carry the refill pages for the gigantic scrapbook and can be found on our website by looking for item number 349161. We hope this information will be of help to you. I was not asking about refill pages. I want to know if PROTECTOR PAGES and KEEPSAKE PAGES are available in this size. Thank you. how many pages come with the scrapbook and can I buy extra pages? BEST ANSWER: Thank you for your question. This album comes with 10 photo pages and additional pages are available for purchase. This album can hold up to 40 pages. We hope this information will be of help to you. Are the pages blank scrapbooking type sheets or are they photo insert pages? BEST ANSWER: Thank you for your question. these are blank pages so that you may mount whatever and however you choose. We included a link to the refill pages for this album to show you another view.We hope this information will be of help to you. The pages are scrapbooking type sheets. They are blank scrapbooking type. Does this album contain special pages for preserving VERY OLD photographs? Like from the 1800's? BEST ANSWER: The description for this product does not say it has acid-free or archival paper. The company should be able to answer that. If the book is to be stored vertically, I would hesitate to put very old photos in it. If it is to be stored flat, it would probably be ok, if the photos still are quite flat. If the edges have curled up, I would not put them in a scrapbook at all. Be sure to use archival corners to position the photos. Thank you for your question. The Gigantic Scrapbook does come with 10 pages that are made of photo safe materials. We hope this information will be of help to you. No. You should protect the old photos themselves before mounting them. I can't tell if the blank scrapbook pages have plastic flaps to protect the page once the photos are mounted. Is there plastic protection? I am looking at the gigantic scrapbook with personalized plaque. BEST ANSWER: No. The pages in the book are high quality but do not have page protection via plastic or leaf. Depending on how creative you are, you may be able to create and insert your own page protectors. no there is no plastic protection for this reason I only mounted pictures and newspaper articles on one side of the page. No, it did not come with plastic flaps to protect the photos. No it does not have plastic flaps and it is very large. No. They don't have plastic flaps. does the gigantic scrapbook have rings so more pages can be added? BEST ANSWER: Thank you for your question. The scrapbook has post bound like holders for the pages and can hold up to 40 pages. We hope this information will be of help to you. It does not have rings, it is held together with screws. The screws can be removed to add more pages. No rings- it has brads that you can open to add additional pages. Are the pages acid free? BEST ANSWER: Thank you for your question. The pages are acid free. We hope this information will be of help to you. BEST ANSWER: Thank you for your question. On tan is available for this album. We hope this information will be of help to you. How many pages come in this book and can you add extra pages to it? BEST ANSWER: Thank you for your question. There are 10 pages in the book. We hope this information will be of help to you. Is this album expandable with posts so more sheets can be added? BEST ANSWER: Thank you for your question. Extra sheets can be added to this album, they are sold separately. We hope this information will be of help to you. To confirm, it only comes with 10 pages or do you mean 10 photo pages and the rest are scrapbook pages? Can you please specifically say what the product comes with initially. Also, For personalization, you can't see what it looks like when you type it in (very small). If I just want initials of my children, can you make the font bigger? Thank you. BEST ANSWER: Thank you for your question. The 10 pages it comes with are the scrapbook pages for the scrapbook. We do no have any other style of pages for the gigantic scrapbook. The font is only printed in the one size. If can not be printed bigger. We hope this information will be of help to you.